When getting ready for my visit to Santa Fe, I thought I would try to find a group to Run with. 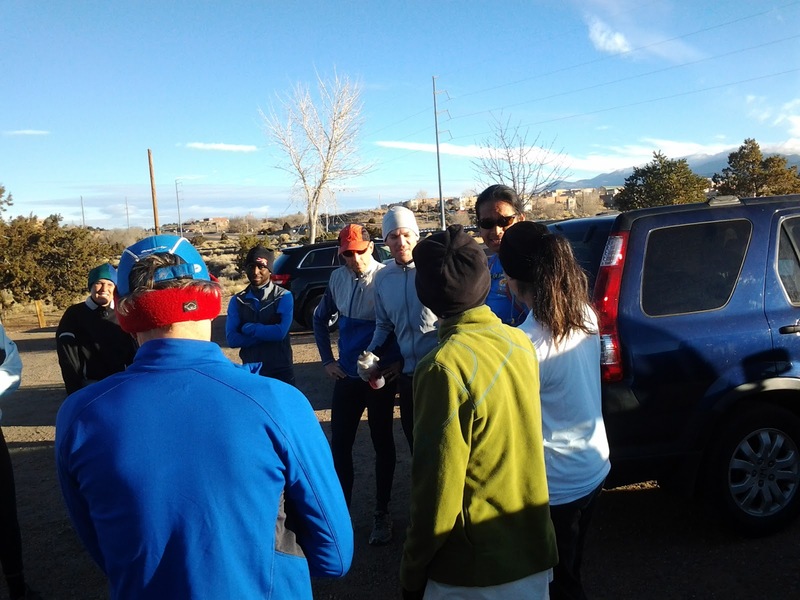 I was fortunate to connect with the Santa Fe Striders first through email with Eric. I met up with the group for their Sunday run. When pulling into the parking lot I was surprised to see an old friend from my club running days with the Santa Fe Los Alamos Golden Flashes, Kevin Brennan. The group met between 8, and 8:15 or so, and then Eric described the run we would embark on in great detail. We then introduced ourselves, as there was a mix of locals and visitors. Then we were off! We were to start in the arroyos which can make for challenging running because the sand is quite thick, and there are lots of little rocks. The group likes to stay together, and as I started to drift towards the back of the pack, Kevin doubled back and stayed with me. I only made it around 20 minutes in the arroyos before I turned back to achieve my 30-40 minutes of running, but the rest of the group continued out of the sand and onto trails, and headed up towards Sun Mountain for their two hour adventure. The group was so friendly and they made what would have just been a difficult, cold run at altitude, really fun, and interesting. Thank you Santa Fe Striders for the great run. I look forward to running with you again whenever I am in New Mexico.